I was curious how many pages I scrapped in 2013, so I went looking through my files, and this is what I came up with. 205 pages. Not too shabby. Before I looked up these numbers I was feeling a little behind....a little overwhelmed at how behind I was...or thought I was. 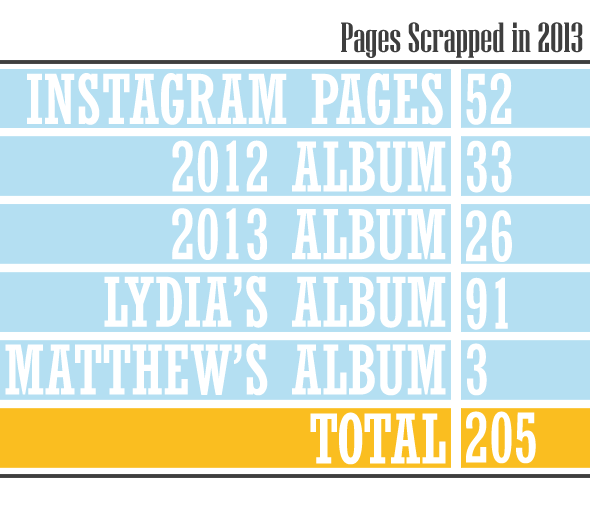 Now that I look at them I see 2 finished albums (Instagram and Lydia), an album that is almost finished (2012) and album that, even though I feel like is WAY behind, at least has 26 pages done (2013) and then Matthew, who isn't even home with us yet, already has 3 pages complete. I'm going to feel good about completing 205 pages...because how can I feel bad about that? Look at what you accomplished in 2013....not at what you didn't accomplish.